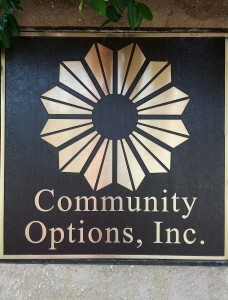 Our Offices | Community Options, Inc. Founded in 1989, Community Options is a national nonprofit with over forty offices in eleven states. Our mission is to develop housing and employment for persons with developmental and intellectual disabilities. With a dedicated board and a staff in excess of 5,000 people, Community Options is funded primarily through federal, state, local and philanthropic investments. All stakeholders believe that every person regardless of the significance of their disabilities should have the opportunity to be employed and to live in local neighborhoods like any other American. In fact, Community Options provide services to more than 2,700 persons with disabilities, and many with very significant disabilities. Community Options has a centrally based infrastructure in Princeton, New Jersey for all administrative and business operations. Applying state of the art technology, Community Options ensures cultural uniformity and stability with fiscal, human resource, information technology, training and governance to all local regions. A 10 member national board consisting of professionals and advocates consider policy and governs the organization with formal quarterly meetings, relevant subcommittees and fiduciary oversight. The board assists the Founder and CEO with strategic planning, budget forecasting, insurance, capital acquisitions, talent, compensation analysis and legal relevance. Indigenous governance under the auspice of a national to regional to local model ensures maintaining the philosophical and ethical integrity of the nonprofit juxtaposed against state and city statutes and regulations. Each city has an office with an executive director, a local advisory committee and a team of dedicated professionals charged with the day-to-day implementation of management and budget. This includes local hiring and staff coaching with regularly scheduled national training and quality assurance. Local executive directors working collaboratively with persons with disabilities, their families, guardians and state contractors and regulators handle all aspects of admission and programmatic development from housing acquisition to supported employment. National leadership guides the local offices by presenting state of the art programs, cash, capital and fleet management budget and contractual obligation compliance and peer training deployment and evaluation. Community Options maintains national grant writing, public relations, social media, information technology, training, quality assurance and mission advancement teams that work in tandem with the local offices. Property acquisition, renovation and on site management are replicated locally using nationally proven models. This includes templates for successful proven entrepreneurial businesses, supported employment models, internships for students with disabilities, and meaningful day supports. Concentrated management based on the effective use of technology keeps overhead costs under 11%. Robert Stack founded Community Options and devotes time to educate federal and state leadership on the relevance of the home and work paradigm. He has been appointed to serve on transition teams and working groups by governors and has maintained membership with the RGA and other political entities delineating philosophy and ethical considerations for long term planning and funding.